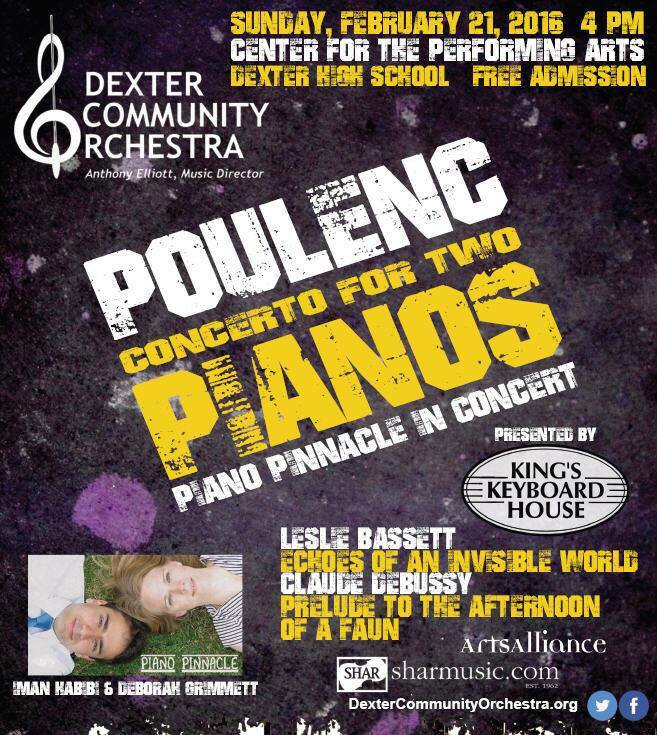 We are excited to be performing Poulenc’s Concerto for Two Pianos and Orchestra in D minor with Dexter Community Orchestra on Sunday, Feb. 21st, 2016 at 4pm at the Dexter Center for the Performing Arts, conducted by the esteemed cellist and maestro, Anthony Elliott, Professor of Cello at the University of Michigan’s School of Music, Theater and Dance. In a letter to the Belgian musicologist, Paul Collaer, Francis Poulenc wrote that he considered this concerto to be “an enormous step forward” and the beginning of his “great period.” He premiered this concerto at ISCM (International Society of Contemporary Music) in Venice with his long-time friend Jacques Février (a video was later made showcasing the two pianists performing the work, with a number of adjustments made to the two piano arrangement). The concerto has become one of the staple works of the piano duo repertoire, and is revered as one the greatest piano duo concerti ever written.